Captivate any crowd with big, bold banners. Choose from several in indoor or outdoor materials. Big, bright banners give high impact promotion at low budget cost. These great attention-getters are especially well-suited for short-term use, annual event reuse, or for outdoor advertising in high traffic areas. Top quality banners are durable in any weather and are completely finished with grommets for easy hanging. he grid below is a starting basis for Banner Pricing. The grid below is a starting basis for Banner Pricing. Banners can be produced Horizontally or Vertically. or call us at (262) 728-2600 Extension 220. 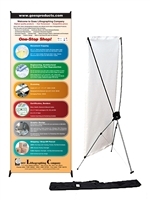 Banner Stand - 24" x 63"
Banner Stand - 32" x 78"
GROMMETS (PACK OF FOUR) BANNER STAND - 24"x 63" BANNER STAND - 32"x 78"